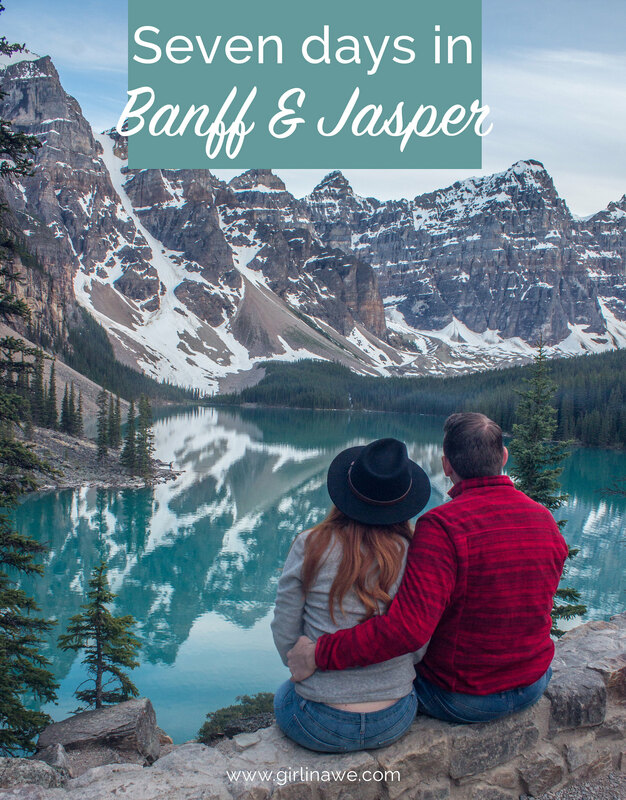 7 days is no where near enough time to discover all that Banff and Jasper have to offer but we found that we got a surprising amount done in a week. When we arrived at Canadian border control, the chap behind the desk did seem a bit befuzzled about us visiting Canada for just seven days but hey, you do what you can with your holidays. In reflection, the way we planned our time in Banff and Jasper could have been a little better as we spent a couple of nights in Canmore, before driving up the Icefields Parkway to Jasper for a few days and then coming back down to spend some time in Banff. I'm not suggesting this is the perfect itinerary but I think it gives you a good idea of what things to try and see on the same days. Emerald Lake is about an hour and a half drive from Canmore (and a bit less if you're staying in Banff) and boy is it worth the drive. You will no doubt have seen photos like this (to the right) on Facebook, Instagram, or Pinterest because it is just so beautiful and shareworthy. Take a couple of hours to stroll around the lake, gawking in absolutely awe of the crazy blue colour of the water which makes it look like photoshop in real life. You can also hire kayaks to go out on the lake as well; we didn't do this but it would certainly be worth it. The price for kayak hire is pretty much the same at all the lakes we went to. We didn't really consider it to be cheap but it is worth it for the memories and experience of getting to kayak on a lake that looks like someone dropped some huge blue bath bombs into. Pick up a snack from the little hut next to Emerald Lake Lodge and then head down the road to visit Takkakkaw Falls. The road up to the falls is well paved but can be quite windy and tight at times but do not let that deter you because it is stunning. The falls are about a 10-15 minute walk from the car. 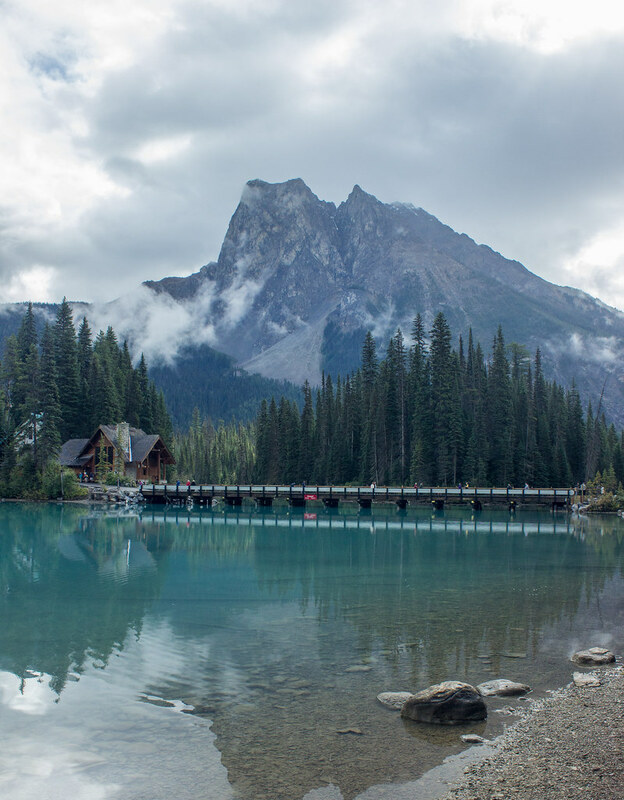 If you want to find out more about Emerald Lake, I did a whole blog post about it. We were camping for the rest of our trip so we picked up our camping equipment from Rent-a-Tent in Canmore. If you are thinking about camping go for it because these guys were amazing and we're hiring from them again this summer. 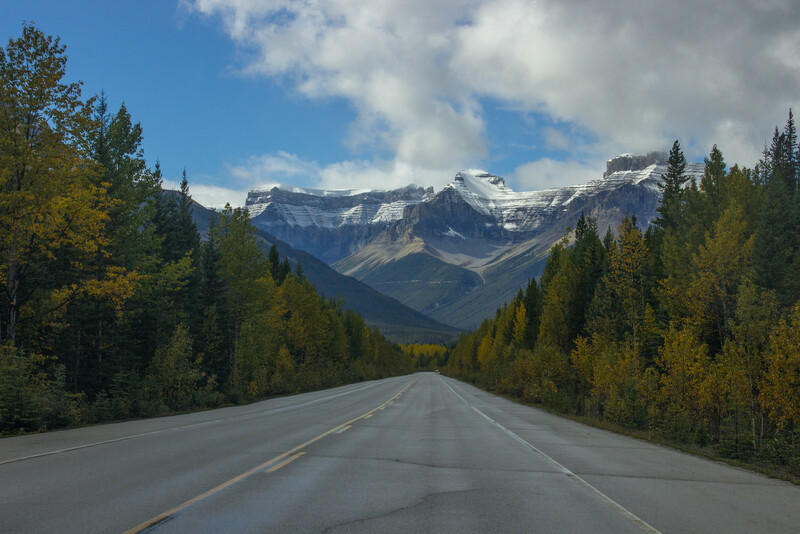 The Icefields Parkway is a 232 mile (144 km) road connecting Banff and Jasper that features in a lot of "best roads to drive" lists, and for good reasons too. 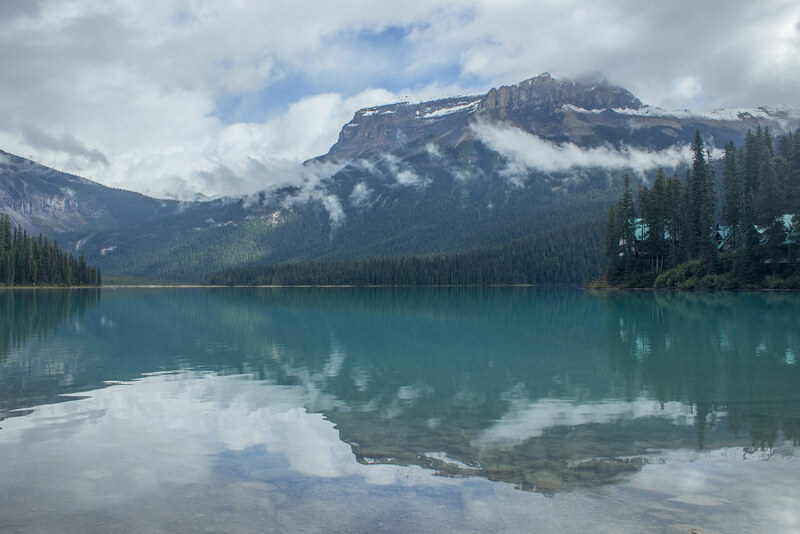 The views from the road are absolutely stunning and there are no shortages of places to stop off; whether it's a lake that is just at the edge of the road or the start of a hiking trail. We made a few stop offs on the way up, including Peyto Lake and the Athabasca Glacier. It is possible to drive the entire length of the Icefields Parkway but as we stopped off a few times it took us about six hours. In the evening, take a stroll around Jasper and find somewhere to eat. We found that some of the restaurants stopped serving food about 20:00 - 20:30, I'm not sure if that's normal in Canada but do keep it in mind. 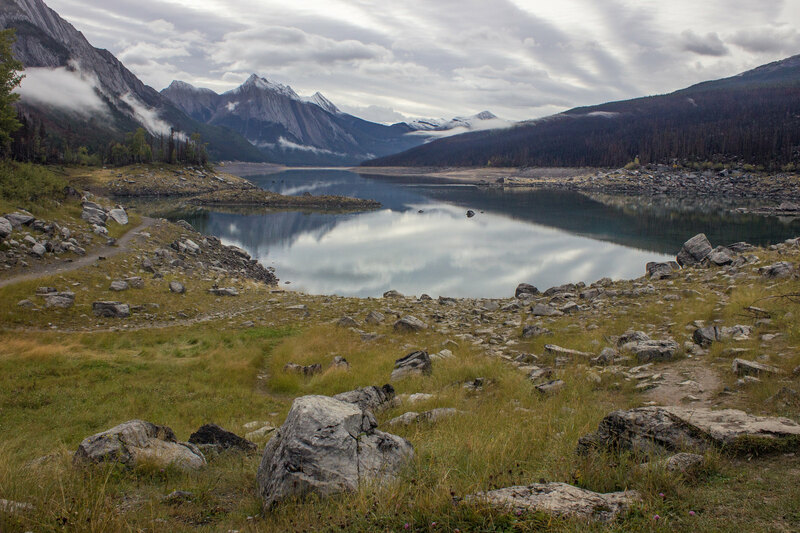 We stayed at: Wapiti Campground, a few minutes drive outside Jasper. 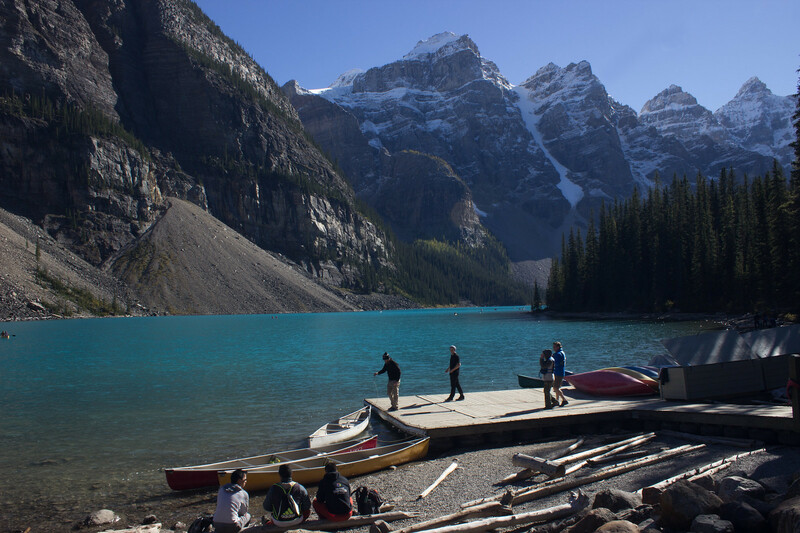 You can find out more about it and reserve a pitch through Parks Canada. 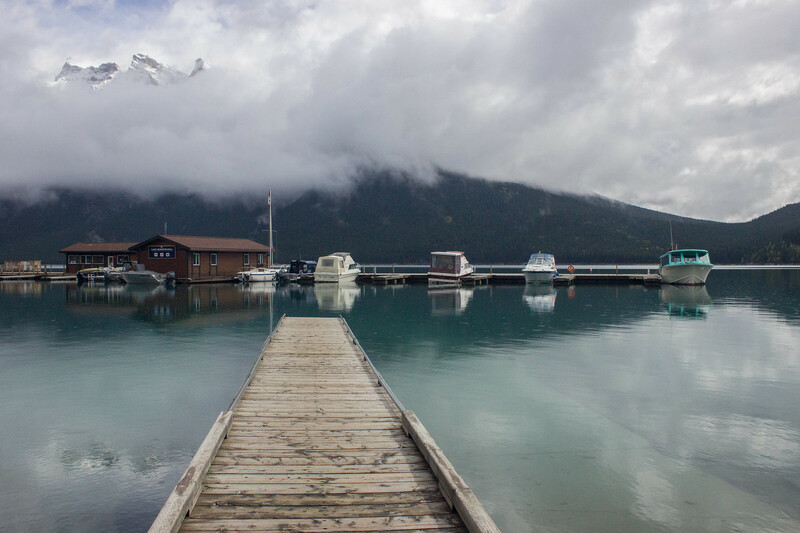 Maligne Lake can be very busy during the high season, so it's worth getting up early if you want to avoid the crowds. Also, if you get up early you are more likely to see wildlife; we saw a huge elk stood on the bank at the side of the road, looking out across his kingdom. We also saw a bear just outside Jasper early in the morning too. On the way to Maligne Lake, it's worth stopping off at Medicine Lake and to see some of the eerie looking prescribed burn sites. 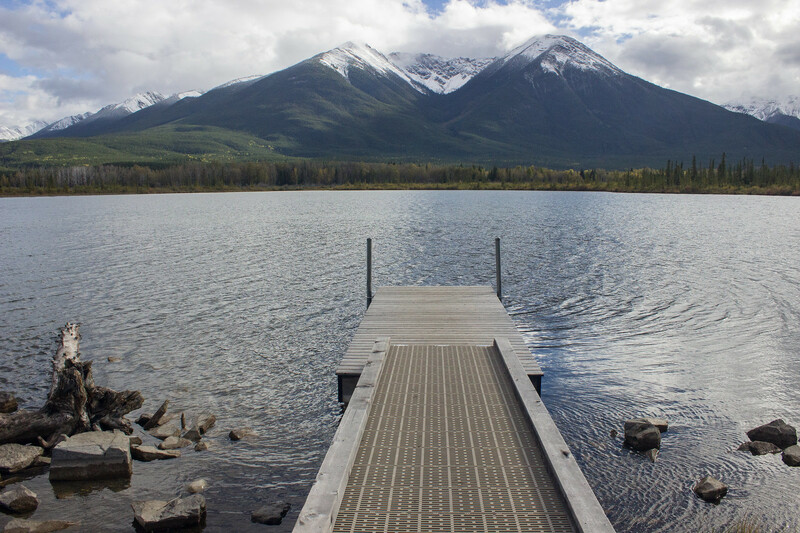 Interestingly, Medicine Lake isn't really a lake and is actually a part of the Maligne River and it fills up to become a lake when the melt water can't drain away fast enough. 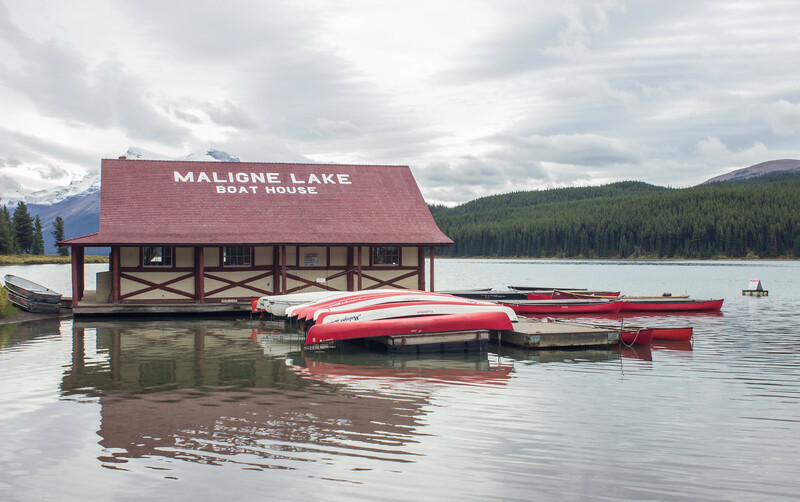 Once you're at Maligne Lake, there are a few trails you can follow, or you can take a boat tour around the lake, or go kayaking. We followed the shortest trail around the edge of the lake and into the forest before deciding to hire a kayak. Let me tell you that I do not recommend you do that if it's a windy day because it was pretty tough and was not entirely relaxing. You can read more about our windy kayaking experience on Maligne Lake here. 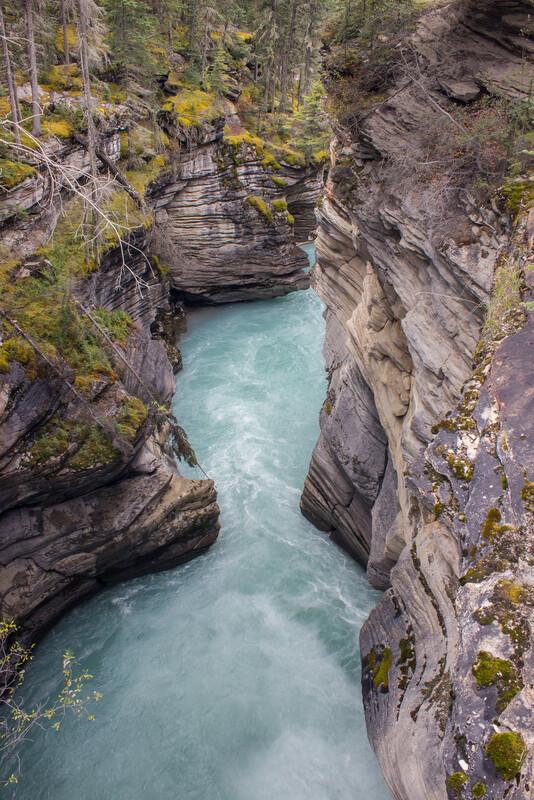 On the way back to Jasper, we stopped off at Maligne Canyon and had a walk around for about 45 minutes. Heights don't usually bother me, but looking down into the canyon was a little mind-bending. We stayed at: Wapiti Campground again. 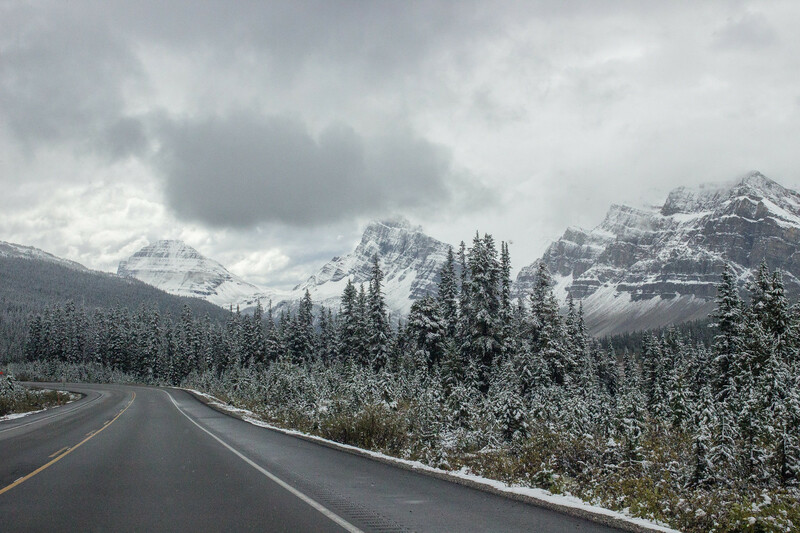 In the morning, we explored some of the stops on the Icefields Parkway closest to Jasper. 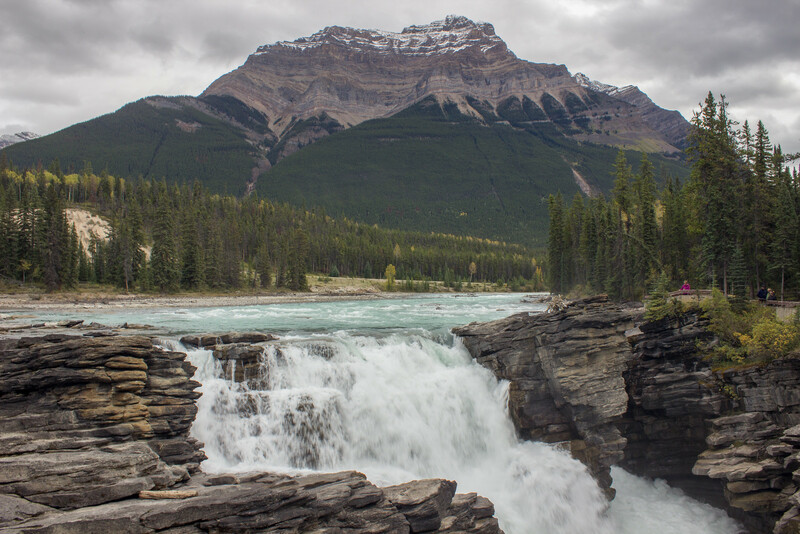 The first one we went to was Athabasca Falls, which is about half an hour out of Jasper, as we decided we'd drive to the furthest point and then start coming back on ourselves. It was basically like a grander and fancier version of the canyon we visited the day before. It had longer trails, a roaring waterfall and the drops seemed even deeper. The next stop was just a few minutes up the road; Horseshoe Lake and it was a real hidden gem. To get to the other side of the lake you have to follow this trail, which feels quite overgrown in comparison to pretty much all the other trails we saw. It was the only time in Canada where I felt like I might get snook up on by bears. The water looked so inviting and I had to stop myself from jumping in. After that, we headed back through Jasper and stopped off a Pyramid Lake. When you see Pyramid Mountain from Jasper and the sun hits it at the right angle, it seems to glow a little and reminded us of a dragon's egg, so we took to calling it Dragon Mountain. We spent the rest of the afternoon wandering around Edith and Annette Lake. The two lakes are really close together and you can easily walk between the two in a couple of minutes. In between the lakes are loads of picnic areas and you can just imagine how packed it must be come a nice summer day. We left Jasper just before 11am and only stopped off a couple of times on the way back down the Icefields Parkway to make the most of our time in Banff. It took us about three hours to drive from Jasper to Banff and we headed straight to Two Jack Lakeside campsite to set up our tent. After being in the car for so long we took a walk around Banff, explored Vermillion Lakes, and Lake Minnewanka. Vermillion Lakes is on the edge of Banff and is a nice little route that takes you past the lakes, that have a distinctive sulphur smell. There is a loop road around Lake Minnewanka called Lake Minnewanka Scenic Drive, and there are a couple of trails which start off the loop as well. Where we stayed: Two Jack Lakeside campsite. Again, this can be reserved through the Parks Canada website. Our sixth day was a seriously jam-packed one. We drove up to Lake Louise to see what all the hype was about; yes, it's very touristy but it is for a good reason because it is beautiful. We followed the Lake Agnes teahouse trail up the mountain to the teahouse, where we enjoyed a spot of well-deserved lunch. It probably took us about 40 - 50 minutes to reach the teahouse and it is possible to go onto do another tea house, called the Big Beehive, but we were not feeling fit enough at all. 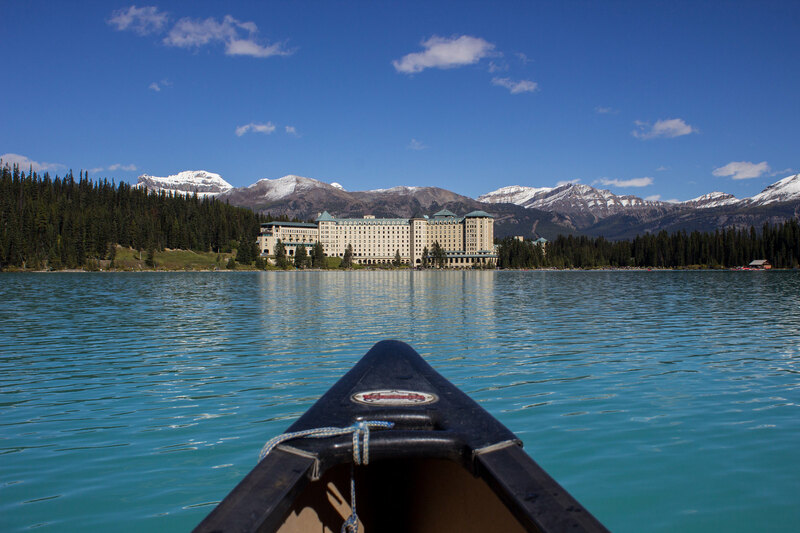 When we returned to Lake Louise we decided to hire a kayak for an hour (read more about that here), which was more than enough time because it doesn't take that long to explore the lake. Afterwards, we drove to Moraine Lake as we'd seen it on the cover of our Lonely Planet guidebook and wanted to see it for ourselves. It was early afternoon by the time we got there and there were buses, camper vans, and cars parked everywhere. Despite that, it wasn't that crowded and it certainly wasn't anywhere near as crowded as Lake Louise. I think we both wished we had kayaked on Moraine Lake instead, hindsight is a wonderful thing. For both of us, Moraine Lake was an absolute highlight of the trip so if there is one thing I recommend you do, out of everything listed here or anything you see in guidebooks, it's Moraine Lake. Photos do not do it justice at all. 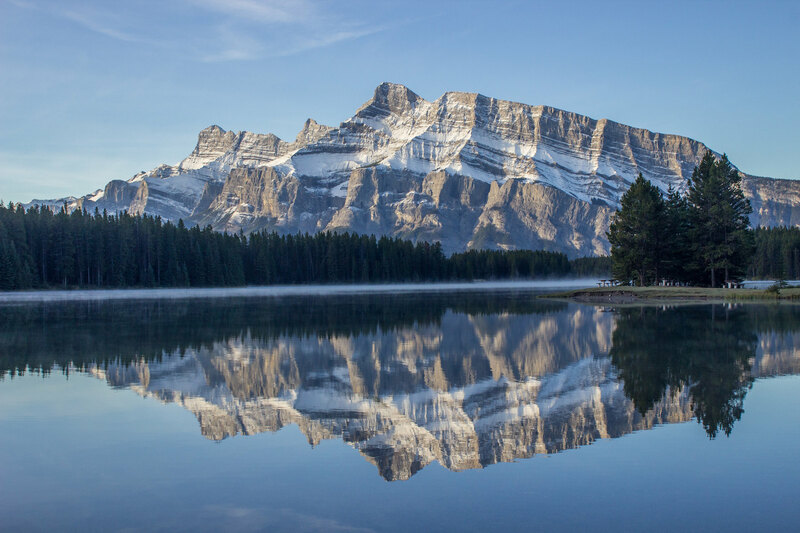 If you are staying at Two Jack Lakeside, or even in the Banff area, I recommend getting up early and visiting Two Jack Lake as the sun rises. I am not a morning person at all but Daz managed to drag me out of the tent at 7am and I was rewarded with this stunning view. If you're hunting for all the red chairs, there are two on the banks of the lake. After packing up our tent we went into Banff to get a couple of souvenirs, headed back to Canmore to return the camping equipment, and then went to the airport. If your flight is later on in the day there are loads more things you could do around Banff, like visit the Cave & Basin museum, take the Banff Gondola to the top of Sulphur Mountain, visit Banff Hot Springs, go to the Yamnuska Wolfdog Sanctuary on the way to the airport, and so much more.